Recently I've been turning my attention to EDM style music. Click here to see my videos page where you can click on and watch the videos I've posted of my EDM music (in the MIDI guitar section of the page). I find a lot of EDM to be a fascinating blend of textures and sounds that have so much potention for evolution and development. 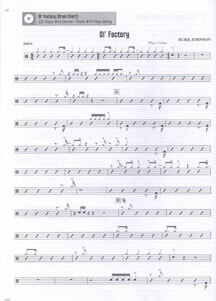 I'm especially interested in blending Jazz and Fusion styles into the art form. 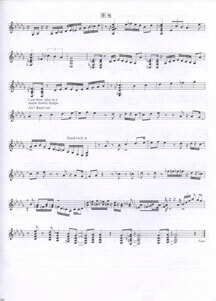 Central to EDM is the use of Controllers. Mostly this is done by DJs who control the performances of their mixes by interacting with these devices. Controllers come in many shapes and sizes and predominately sit on a table or surface of some kind. 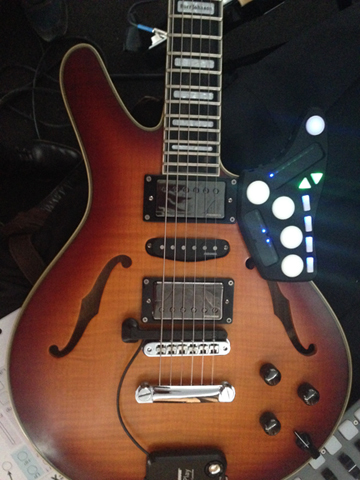 I'm trying to do the same sorts of things but by using controllers that are connected to the guitar. Two examples are above. The Robocaster (upper right picture), designed by Ben Lewery (visionaryinstruments.com) is a fantastic way to get this done. He and I have a new build coming soon which will easilly be the best option for this sort of thing. 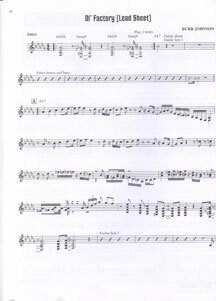 The Guitar Wing (upper left picture) is more of a consumer level piece that mounts on the guitar. 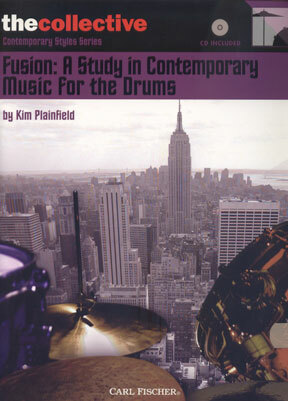 A super great starter product for exploring this new a exciting music direction. Check out (Click here) Control Freak 5 to see what I've been up to. Very nice man indeed. He has decided to add MIDI guitar to his skill set and we did great work together. 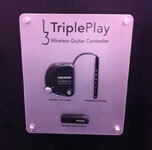 "Back at Music Messe with a vengence"
Triple Play Wireless Controller built inside"
At the NAMM show this year I was demonstrating the new Fishman "Triple Play" Wireless Guitar Controler. system that will break into the mass market and finally elevate MIDI guitar to its rightful place. Click here to see some pics from NAMM. 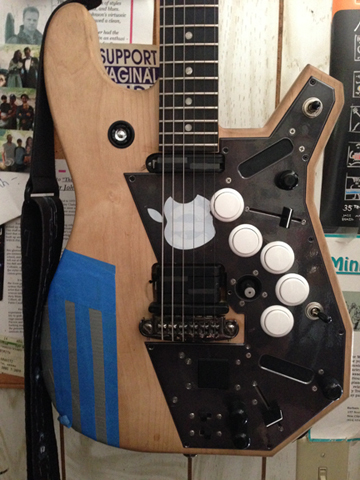 The first wireless MIDI guitar. Now that is worth writing home about. 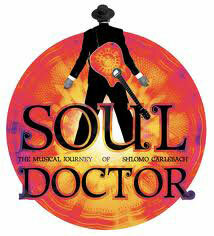 "Burr Johnson programs the MIDI guitar chair for the new Broadway musical Soul Doctor"
Click here to see stuff about the show. guitar player would only need to press a pedal every time he needed to advance to the next sound in the show. out Pat has a very unique playing style that causes the Axon to become confused (some machines are such bone heads). get messy. Anyway we worked on it for a bunch of hours and he seemed to be quite happy when he left. 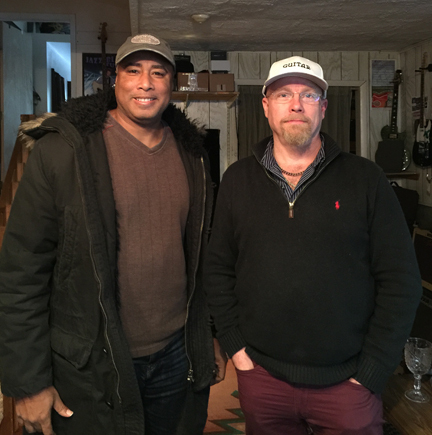 Click here to see his comments about our time together. Pat is truely awesome. Very open minded, very warm. 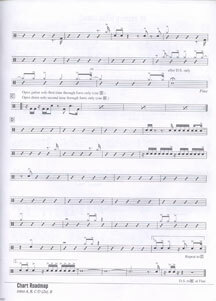 printed pages of the music. 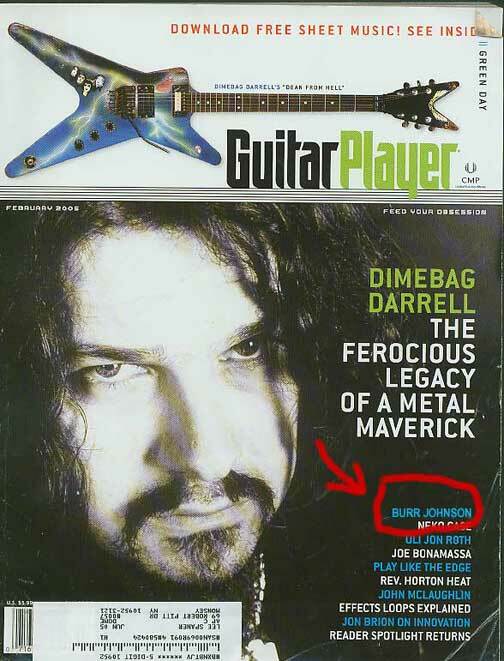 "Mike Varney Writes an article on Burr Johnson"
Guitar Player Magazine did this article showcasing different Fusion artists and in this issue, I was featured. 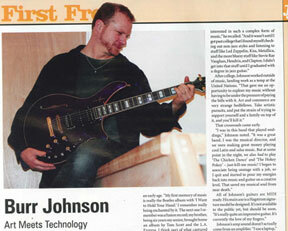 guitar-synth soundscapes, which serve as foundations for his masterful soloing." When I flew to Germany that year I wasn't sure what I was going to find. I knew I was shooting a video but I was unclear as to what kind of budget these guys had been given and for how long we'd be at it. Turns out it took two days in which I had to wear the same shirt I had on, under super hot lights, two days in a row with out being washed (I had to look like this was all completed in one sitting)(I guess people don't like having the actors in their infomercials/testominials/turorials, or what ever you call this thing, to make costume changes. Lots of cameras, lots of lights, lots of work. but we got it done. 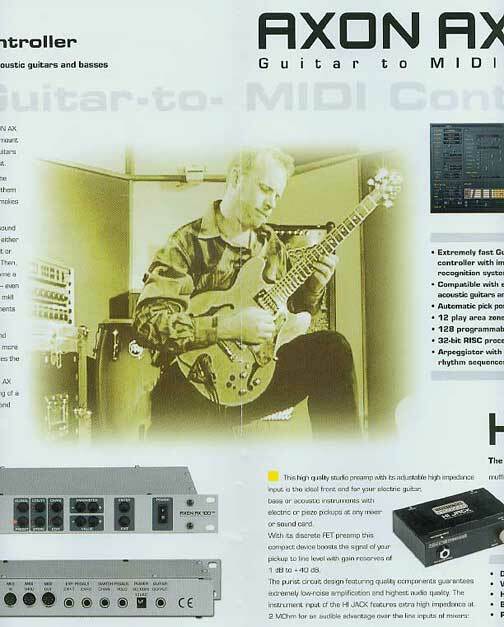 When I got there I realised they wanted me to use the AIX 101 (seen on the guitar in the picture below) instead of the built in Gk2A I had beautifully installed by David Lee. So I had to literally cut the pickup out and replace it with what you see down below (scaring). 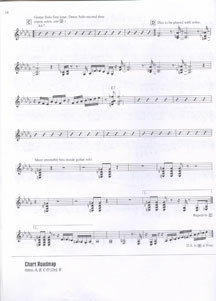 Click here or on the image to see the footage. Its kind of funny actually. So if you are not satisfied and still want more, please click below and continue viewing.